It's not only fun at Oktoberfest and Hofbräuhaus, it is also the Deutsche Museum and BMW. 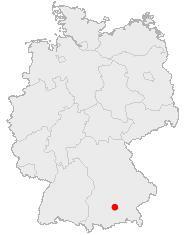 In 2006 the FIFA world cup will be inaugurated at the newly built Allianz Arena formerly the Olympia Stadium in the heart of the Olympic Park in Munich - a bluely-wafered brilliant piece of architecture by star architects Herzog & De Meuron who also built the new shopping mall at the Marienplatz named "5 Höfe". Next to the "5 Höfe" and its spectacular splendour you will find the Feldherrnhalle near the Residenz where "Adolf Hitler" himself led an assault of riflemen against the local government of the German Reich - the German Reich that was struggeling hard after the catastrophy of World War I to turn from a thousand year old Kaiser-Reich into a modernized republic. World War II left Munich in ruins. Few buildings were left untouched by the Allies' bomber fleet. However, Munich is way beyond the "post war brutality" of many German cities that were eradicated during the air raids. 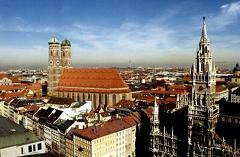 One of the best examples of the preserved medieval feel is the Frauenkirche, a symbol of town. Not very far from Frauenkirche is another, astounding sacred building, a church in an almost metaphysical baroque style - the Asamkirche. It was built as a private church in the middle of a street. If you ever have been astounded by lp-covers of "Pink Floyd" - that famous rock group of the 70ies - you might not want to miss Glyptothek, Pinakothek and Propylaen where legendary and "crazy" Bavarian kings tried to resurrect classical Greece in an attempt to stop the final countdown of the Bavarian monarchy. There you will see a mysterious black monolith that seems to have landed from outer space. For cultural education you can visit the German Museum, Tollwood and the National Garden Festival in Munich. You can reach all destinations by our sophisticated infrastructure - by train, bus and/or subway with the head node Main Station in the middle of Munich.